The Archdiocesan Youth Conference (AYC) gathers over 2,800 participants - both youth and adults - from all over the local Church. AYC is the largest evangelizing event for older adolescents that the Office of Adolescent Catechesis and Evangelization hosts annually. Through this event, incoming ninth graders through outgoing high school seniors are challenged to live out their faith, learn informative presentations, listen to outstanding national speakers, and make new friendships. AYC provides youth with a unique opportunity to interact with the Cardinal and Auxiliary Bishop of the Archdiocese to celebrate the sacraments, to pray, and reflect on the role of the Young Church of Galveston-Houston. Participants will experience the diversity of the Archdiocese of Galveston-Houston! They will have the opportunity to share and deepen their relationship with Jesus Christ through daily Mass, Exposition of the Blessed Sacrament, confession, and other prayer experiences. Who may go: 8th Grade Graduates - Outgoing Seniors. Camp Basic is a five day Catholic summer overnight camp. This will be a week of growth in the faith with talks & discussion groups. Youth will build friendships throughout the week and have a blast with activities like archery, canoeing, ga-ga ball, basketball, volleyball, horseshoes, and frisbee. There will also be a swimming pool with slides, a low ropes course, a BB gun range, and a BLOB! 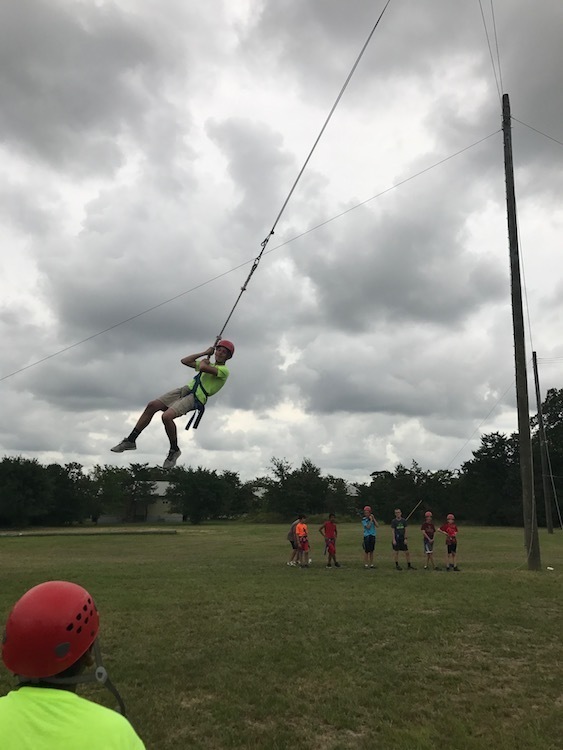 Camp Basic gives middle school students a taste of youth ministry, builds genuine community amongst the group, fosters conversion, and allows youth to take the next step towards deeper faith. We want youth to have an exhilarating experience of the Catholic Church! The camp is open to all current 6th, 7th, and 8th graders put on by your parish youth minister in union with Ablaze Ministries. The youth ministry team will be joined by a group of high school leaders from your parish to help lead the camp. The cost is $285 (or $270 if you register before April 15th) for five days & four nights; this includes lodging, transportation, meals, all activities, and a t-shirt. Checks should be made payable to your parish. A $135 non-refundable deposit is due upon registration to reserve your spot. The full amount and all registration is due by June 8th. Registration is first come, first serve, so turn in your paperwork & deposit quickly to reserve your spot!